Skincare routines are nothing new to the blogosphere, I’ve read about a dozen myself just this year. However today I thought I’d throw my current summer skincare routine into the mix, because I love to read about what products work for different skin types. Not every product will suit every person, so I like to hear suggestions from other people who have dry skin. I’m going to discuss which products I use in the morning and which I leave for night time. I recently did an instagram poll asking which you would prefer to see and the result was 50/50- typical. So for a quick bit of background, I have dry skin and I don’t really get many blemishes. Although, I have recently developed some eczema underneath my eye, which I’ve had to treat with steroid cream. I also work in a highly air-conditioned workplace which really doesn’t help dry skin. So first thing I always cleanse my skin with Liz Earle Cleanse and Polish. My absolute favourite skincare product, if I could have one item only, I would always choose this. After cleansing, I use the Sukin Hydrating Mist Toner to close up my pores (if I remember) and then leave my skin to have a breather. Then it’s onto SPF. 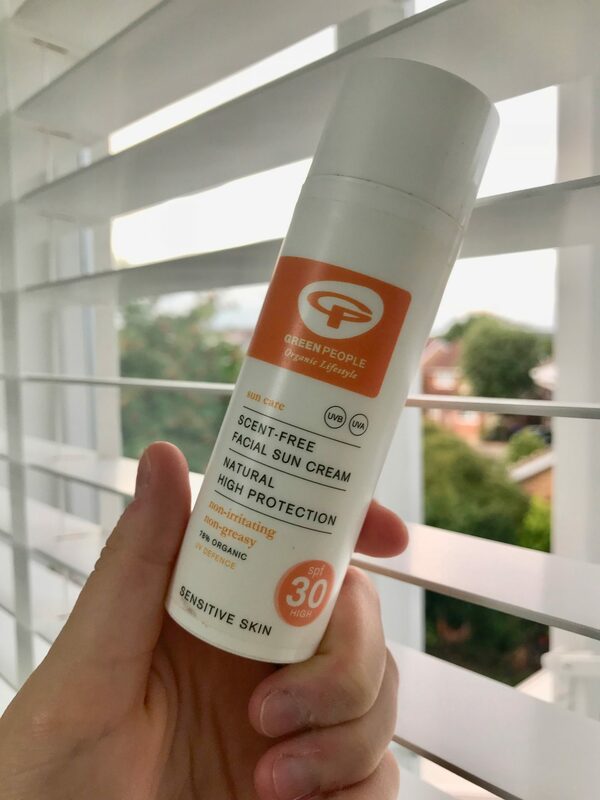 I recently mentioned the Green People Facial Suncream in my Summer Favourites– it’s ace, and I can’t stop talking about it. It’s non-greasy and it keeps me protected form the sun without compromising how my makeup sets on my face. If you want an in depth review, there’s one here. Finally after the SPF has sunk into my skin, I add another layer of moisture with a daytime moisturiser. I currently have the Superdrug Vitamin E one, it’s cheap, cruelty-free and leaves my skin feeling great. Vitamin E is essential for dry skin, and I need all the help I can get. By the time I’m home from work, I’m ready to wash off my makeup and get my skin back to feeling fresh and hydrated. Again, I use Cleanse and Polish to remove my makeup using a muslin cloth. If I remember I try to tone again at this point, toner is the product I’m laziest with. Now this is where I pull out the big guns hydration wise. 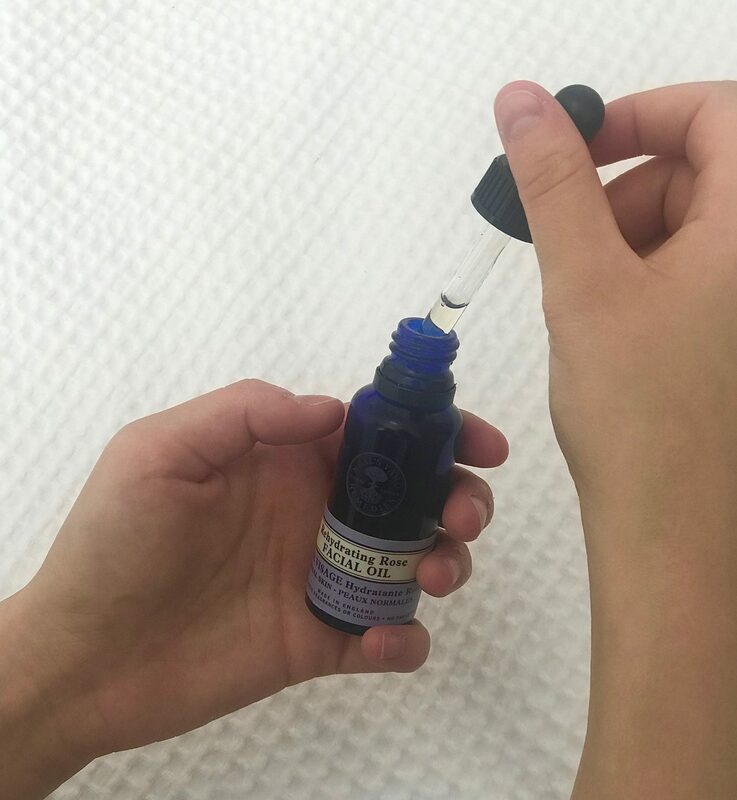 I enjoy applying a few drops of the Neal’s Yard Remedies Hydrating Rose Facial Oil in the evening. It’s consistency lends it to evening skincare, when no makeup is required. Despite it’s oily formula, my dry skin drinks it in very quickly. This stuff smells divine and the small bottle has lasted me months and months, so it is a worthy investment. When the oil has all but disappeared I finish off my routine with the nighttime version of my Superdrug moisturiser-again my skin doesn’t take long to absorb all the moisture. As I mentioned at the start of this post, I now have eczema underneath my right eye. Sometimes it’s not that bad, other days it is flaky, sore and bright red, which gives me the look of having a black eye. I can’t use steroid cream from the doctors all the time because it thins the delicate skin, so I’ve had to find something else. 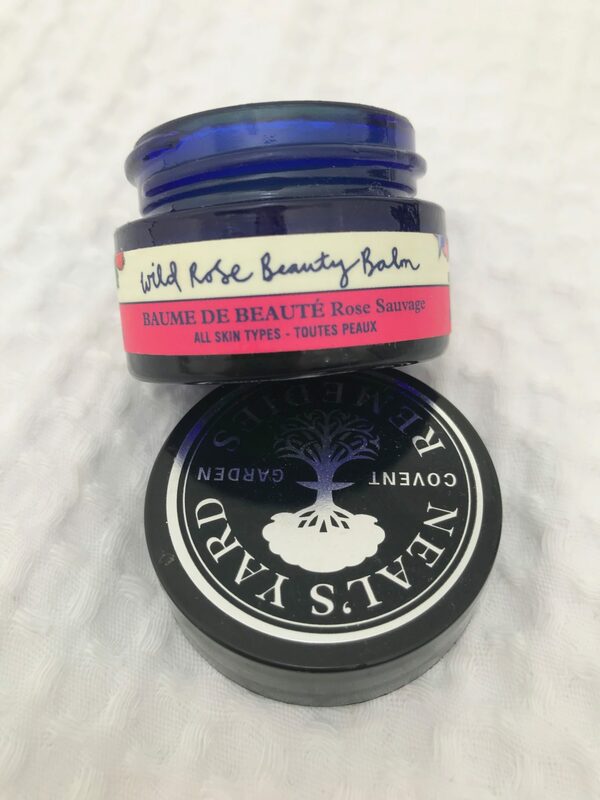 This is when I would apply a generous slick of the Neal’s Yard Remedies Rose Beauty Balm. It’s an all purpose natural balm that seems to really do the trick. I apply it nice and thick when I’m not leaving the house and let it work it’s magic. Very occasionally, if I’ve got a day off or I’m having a lazy weekend I’ll apply a face mask. Over the years I’ve tried a few, but I have found my favourite to be the Glossier Moon Mask. As I’m not prone to spots I don’t need a purifying mask, what I need is moisture. You’re meant to apply this creamy mask for 20 minutes and then wash off the excess. Well there is no product left to wipe off my face after about 10 minutes as it usually all sinks in. I love feeling like I’ve given my skin a hydration boost and my face is left super soft too. So there you have it, my current summer skincare routine. If I’m being honest I don’t think it’s over the top. I just do what I can to keep my skin hydrated, and therefore looking healthy. What skincare products do you swear by? Are our routines similar or way different? Let me know in the comments if you think I use a lot or not many items, I’m curious. 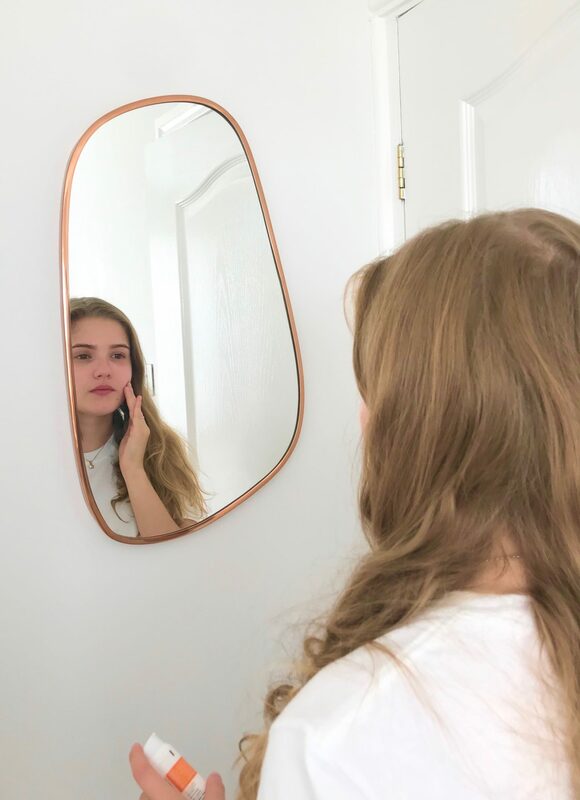 I think you use the perfect amount of product because they all do different things – some people have so many skincare products it cannot possibly be good for their skin! I have heard so many good things about using oils on your skin so I will have to check some out for myself.